Relief maps to this resolution are intended for infrastructure, digital maps are very detailed in three dimensions and are extra, although it may have interesting facts that are free .. 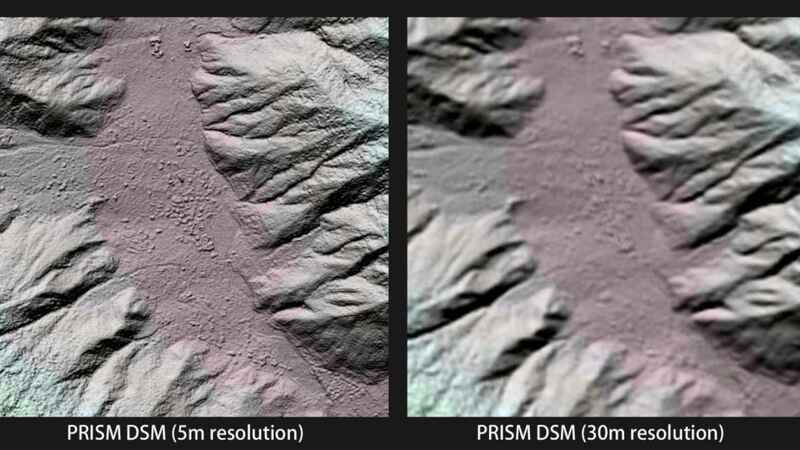 The map AW3DTM uses a digital elevation model (DEM) with a resolution of five meters and uses some three million images taken by the ALOS satellite Japan Aerospace Agency (JAXA), manufactured by Daichi. So far we had projects ranging from 90, 70 to 30 m. among others as the ASTE Gdem project. They have now announced that they have completed coverage of this 3D mapping service, which now covers even Antarctica (albeit partially). They are financed by selling maps, and leaves about 200 yen (1.50 €) The km2 although it can reach 40 euros per square kilometer recreations also included in vector format map of buildings and structures in 3D with resolutions between 2 and 0.5 meters. This is the quid of the question. Coz we have lots of places covered with high detailed DEM, and many are free. For example, i remember playing in MSFS 2002 with Andalucía 5m DEM (my place in Spain), and it was great. Some countries make detailed DEM and serve for free. So if we can merge data we can enjoy them. and I agree with you that it could be quite nice for specific commercial applications in OT. Note: I do not claim to know everything. I just like to help people around the forum. I think a cliff in the middle of nowhere shouldn't be so noticeable, unless you personally now the area very well in real life. The problem here would be getting the roads to match without some absurd construction (huge ramps or oddly inclined bridges). After all, roads are supposed to be procedurally generated too.